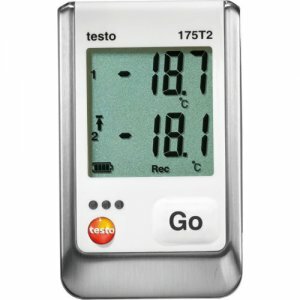 the Testo 175 T2 can monitor and document the air temperature in refrigerated and deep-freeze rooms, as well as record the temperature of the goods. The Testo 175 T2 has an external sensor input (NTC) with which, for example using permitted food probes, you can meaasure the core temperature of the goods, or beteween the packaging of packaged, deep-frozen goods. Like all Testo data loggers for applications in the food sector, the Testo 175 T2 is tested according to DIN EN 12830 by the ATP testing section of the TÜV Süd.